With an even breezier weekend on the cards, so the Royal Ocean Racing Club’s IRC Nationals got underway on the Solent today in sunny conditions with winds that at the peak of the sea breeze saw gusts into the low 20s. PRO Jamie Wilkinson set three courses over towards Hill Head, the first two being windward-leewards, but as the breeze built so the third was longer, lasting around one and a half hours including some reaching legs back to the main land shore. In Class Zero, Johnny Vincent’s modified TP52 Pace scored three bullets against her sole rival, Rob Grey and Sam Laidlaw’s Farr 52 Bob. In the last race Bob’s crew demonstrated an impressive kite trawl at the leeward mark that left their chute in tatters. Meanwhile in Class One there was a first class demonstration of the latest in IRC technology with Jonathan Goring’s new Ker 40 Keronimo comfortably winning the latter two races. The reason for Keronimo’s 10th place in the opening race was due to an error in timing by the afterguard on board, when they all set their watches one minute too late. “We were 45 seconds late for the start,” Goring bravely admitted. The brisk conditions favoured the new Ker 40, hanging on to the larger 46 footers, such as Piet Vroon’s much travelled Tonnerre de Breskens 3, upwind and able to get up on the plane on the downwinds. According to Goring in 20 knots of breeze they were regularly seeing 15-17 knots. Whether Keronimo will enjoy as much success if the wind pipes up even more over the weekend remains to be seen. “Boat handling might be an issue - we are way over canvassed, but if we can keep it upright...” warns Goring. 2010 Rolex Commodores’ Cup winner Anthony O’Leary and his Ker 39 Antix claimed the first race in IRC One, and while O’Leary says racing at the IRC Nationals is the most competitive he has seen so far this season, he says Keronimo won the latter two races “by an incomprehensible amount.” Despite this, with a discard already kicked in, so Antix lies in second place, just a point adrift from Keronimo. Aside from Keronimo, the star performer of the day was Peter Rutter’s Grand Soleil 43 Quokka 8, which scored three wins in as many races in IRC 2. “The racing is incredible, it is a matter of feet on the start line that defines the race,” described the ex-RORC Commodore. 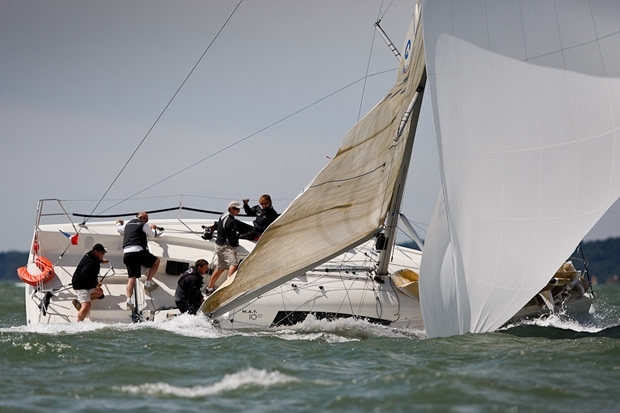 According to Rutter there is added fire in the belly of his crew at this IRC Nationals, as they have frequently come second at this event, but they have never won it. Quokka 8 currently leads Nicolas Gaumont-Prat’s First 40.7 Tradition Philosophie IV and Jim Macgregor’s Elan 410 Premier Flair on five and six points respectively. After three races and an early discard there is a tie at the top of IRC 3 between Mike Bridges’ Elan 37 Elaine and the perennially successful First 35 No Chance of Chris and Hannah Neve. However on the race course much of the entertainment was being provided by the Mark Mills-designed, MAT 1010. After winning today’s opener, as the wind piped up she broached in both the second and third races. “We were a little bit short on crew numbers,” admitted tactician Stuart Childerley, who with Peter Morton and Kelvin Rawlings, has jumped on to the MAT 1010 fresh from their victory in the Coutts Quarter Ton Cup. “The first race we did really well but in the second, I must have been asleep because we turned the boat inside out on the first run so we lost a good position there and in the third we did the same thing. So it wasn’t a very good day for me downwind,” concluded Childerley. With conditions forecast to get brisker still over the weekend, this is likely to take its toll on the smaller boats. Already today, Tim Harrington admitted they had their hands full on his and wife Sarah’s X-35, Vortex. “We didn’t broach, but a few others did. Normally we are first on the list to fall over, even the X-37 fell over...” Downwind 17-18 knots represents the top end for their Code 2 spinnaker, he explains, whereas some of the heavier boats can hold theirs into the 20s. Impressively in IRC4 it is some of the rejuvenated old IOR boats that are showing the way. After New Zealander James McDowell won today’s first race aboard his Quarter Tonner Blackfun, leading overall at the end of play today is Michael Kershaw’s Half Tonner, Chimp. Tomorrow three more races are scheduled with the IRC Nationals concluding with a final two races on Sunday. Conditions over the weekend are forecast to be 20-25 knots with intermittent sun and rain.